I taught the Lace Cuff again yesterday and had five students. It went well and everyone walked out with a bracelet on their arm........well everyone except the man in the class! 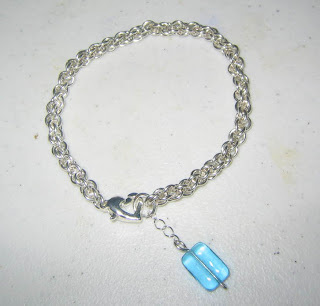 He took the class to make this beautiful bracelet for his wife! His color choices were sky blue, silver and gold. Absolutely great combo. I'm sure his wife is very pleased with his efforts. If not, well she should know how lucky she is! His initial worries were that his large hands would not be able to handle the needle and thread and the small beads. He had no problems at all! Today I'll be teaching the Egyptian Coil at Crafts N Stuff in Vero Beach. I'm anxious to teach this piece since it's one of my favorites. 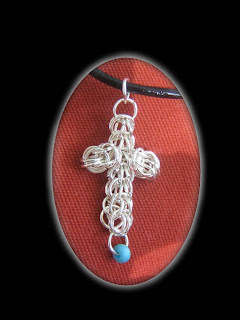 I've been concentrating more on chainmaille than anything. I've done two more Jens Pind and this Parallel weave. I've also done another Twice Around the World, this time in silver plate with purple beads. 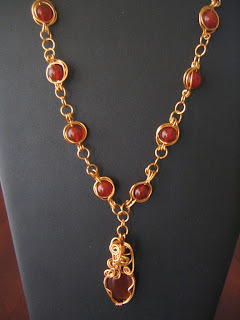 Not as nice as the bronze with carnelian! I finally got to attend a St. Lucie Rock and Gem club meeting! It was very interesting and I've decided to take a table at their show in November. This show will be held at the Martin county fairgrounds the first weekend in November. Last year's was really nice so I'm looking forward to this one. I found out that the St. Lucie's chapter is the 2nd largest in Florida second only to the Jacksonville chapter so it should be a big show! Yesterday's class went well. 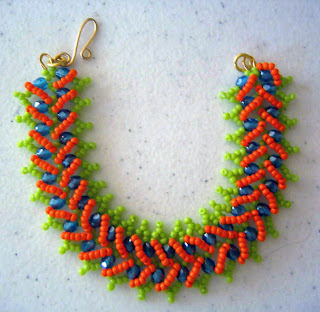 We did Wire/Bead Crochet. I've been lazing around the house today. It's the first day that I haven't had a lot to do. I finally have a date for the class at Crafts and Stuff! I'll be pretty busy next week! The picture is one of my latest creations! 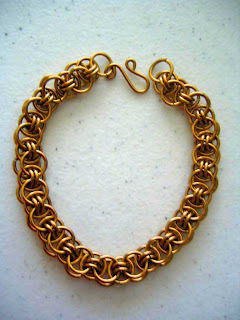 The design of the chain portion is one of Mei's designs called Twice Around the World. The wire wrapped pendant is my own design. The wire is bronze which I like much more than copper! The stones are unknown to me. I have to pay more attention to what I buy! I think that this is one of the prettiest pieces that I have made. Thanks Mei! This Jens Pind weave has been bugging me since last November. I cancelled a class that I was going to take in West Palm Beach. I figured I could teach myself and save the money! Well it didn't work out that way. I've tried so many times to learn from on-line tutorials. I finally broke down and bought Spiderchain.com's 2nd instructional DVD with Jens Pind on it. In a matter of minutes it all became clear! Thank you Spider! Now on to try other weaves. Just One More Thing, Today! 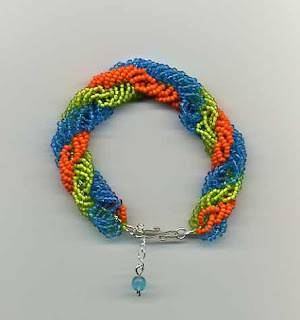 I have to show a picture of the bracelet that I started on Friday in the class that I taught. It took a while to finish but I did finish it this morning. I'm calling it my Parrot Line Triple Spiral. I'll be doing more in these colors or similar colors. I love the colors, very tropical! What do you think? I've been quilting since 1998. Since I've found jewelry making I've slacked off on the quilting but I figure that all the work I've put into quilting the quilts that I've made deserve some of the spotlight! 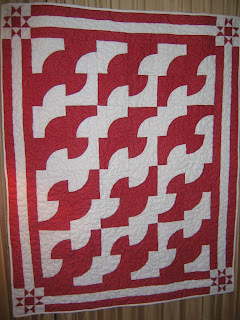 This quilt was made in January of 2006 while I was helping with the grandkids in San Diego. It is, for the most part, hand pieced. I took it to a quilt store to be quilted since I didn't have my machine with me. I think it came out real nice! The pattern is a variation of Drunkard's Path, just arranged differently. I've named it "Soaring". I finally got a garden planted here in Florida! I've been here 2 1/2 years and have not really attempted to plant. This is very unusual for me since I've always had a garden of some sort. Florida planting puzzles me! I'm from Long Island, NY and am used to the short planting season and lots of moisture! The rain pattern is so different here. I think that Florida depends on short periods of very heavy rain whereas NY has days of overcast and rain. The soil is so different. It's very sandy so it needs to be supplemented. The bugs! I was awake half the night with the mosquito bites! Actually, there was this little bugger that found me and followed me around Home Depot's garden center. I would have bought more but I had to get away from him! I have at least 10 bites on me and I never was able to get him! I went to Horizon Nursery in Vero Beach for the bulk of my plants. Great service and their knowledge about Florida planting is unbeatable! 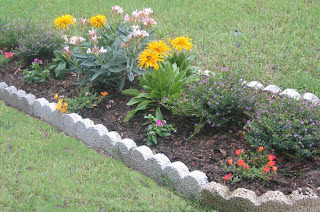 This will be the first of a few gardens that I will be doing here. I want to see how this one survives the summer before I plant the front of my house. The nice thing about planting here is I can do it in my swim suit and then go and jump in the pool to cool off.....which is exactly what I did! Today was another good day. I did some jewelry making this morning. 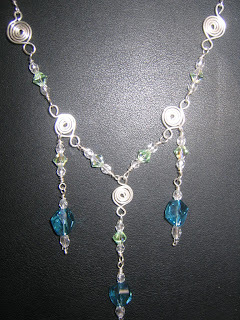 I came up with a very pretty necklace made with silver wire and Swarovski crystals. The class I taught at Beads and Baubles went very nicely. The ladies that I taught picked up pretty easily and they were fun to be with. I'm not going to Mary's for Father's Day cause the father, Oliver, has a bad cold and is in great need of a restful weekend. Erica is sick, also, so I think I'll postpone my trip until Erica's birthday in two weeks. Laura started her job at Target. It'll be good for her to get out and get some money for herself. I'll look forward to going to the pool and relax tomorrow. Wow, it is soooo quiet here! I haven't done much of anything today except clean up, work on my website and edit the pictures from the wedding. I spoke with Liz today. She got home safe and sound. They encountered some thunder storms on the way but all went well. I also got a call on Skype today! Someone, called Kamal, from Moracco who wanted to improve his command of the English language. He seemed very nice and not only wanted to improve his English but wanted to learn some slang! I spoke with him for a few minutes and found that he is an accountant and wants to move up to a new job but needs fluent English for this. He sounded like a very interesting young man. Wow, what a week I've had! My son, Bill and his family, were happily with me for the past week. We did some exciting things like tour the Kennedy Space Center. It was interesting since the last time I was there it was two weeks after 9/11 and most of it was closed for security sake. My granddaughter, Emma age 7, was very excited since she wants to be an astronaut when she grows up! Tuesday they went on an air boat ride in the swamps of Vero Beach, FL (see link on my web site). They said it was great and they saw many, many alligators both large and small! They kids loved it. The rest of the week went between the pool, shopping and the beach. My daughter, Liz and family, arrived on Wednesday afternoon and the kids all enjoyed playing together. We had a few skirmishes but they mostly played nicely with each other! Friday we all headed to St. Pete Beach to the Sirata Resort. We met my daughter, Mary and family, and my son, Nick and his son Nicholas. Saturday we all attended a beautiful wedding on the beach. The weather was ideal! Blue sky, white sand, low humidity...........just so stunning! The bride, my niece Jackie, was sooooo beautiful! I can't tell you how many emotions went through me when I witnessed the ceremony. My brother, Bill, was just so proud! I only wish our Mom & Dad, Blanche & Bill Smith, could have seen her! I know that they were there in spirit. 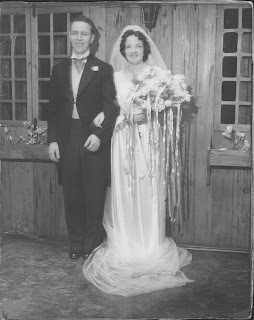 I'm posting their wedding picture for this post. We all miss them. This is so not my usual blog entry! I'm from Long Island and I usually catch up on news from a daily Newsday e-mail. Wednesday I was very shocked and upset to see an article about a 59 y/o woman's murder. She was babysitting for her grandchildren when this monster sexually violated one grandchild and brutally murdered the grandmother. This happened in the town where I grew up and lived most of my life! That same evening, while calling a friend, I found out that the murdered grandmother was a friend of another friend. This fact brought this so much closer to home. It actually shook my world just a bit! Is there any real security in this world? Are we all so vulnerable that we have to constantly be on our guard even in our own homes and in the homes of our family? My sympathy goes out to her family and all her friends. I can't even start to imagine how they will all deal with their loss! I pray that the children involved in this horrible event will find support in dealing with this. My prayers are with them all. I make jewelry. I do a lot of other things but when I'm not traveling, jewelry making and teaching jewelry making takes up a whole lot of my time! Leave a comment. Tell me what's on your mind...............Do you like my jewelry? What's going on in your life? How's my blog? Do you have the same joys, likes, dislikes, problems? Tell me! Simple theme. Theme images by hanoded. Powered by Blogger.